However, senior Union ministers Rajnath Singh and Mukhtar Abbas Naqvi said the Centre was working towards achieving inclusive growth and it did not allow religious discrimination or casteism. 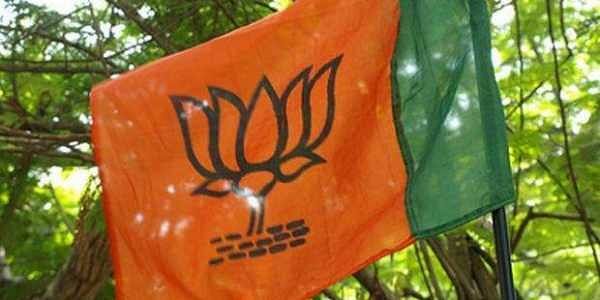 File Image of BJP flag for representational Purposes. NEW DELHI: A political controversy has erupted over Delhi Archbishop Anil Couto’s statement on the country’s “turbulent political atmosphere” and his call for a year-long prayer campaign ahead of the 2019 general elections. While the ruling BJP said the Archbishop should not have made the statement, the RSS claimed it was a “direct attack on Indian secularism and democracy”. In a circular sent to churches and Christian institutions across the city on Monday, the Delhi Archbishop asked the community to hold prayers and observe a fast on Fridays for the nation’s sake. He said the “turbulent political atmosphere” posed a threat to India’s constitutional principles and secular fabric. Many BJP leaders, including chief Amit Shah, came down heavily on Couto for making a “prejudiced” statement. “I believe nobody should talk of polarising the people on the basis of religion,” Shah said. He also played down the support extended to the Archbishop by opposition leaders like Mamata Banerjee and N Chandrababu Naidu, saying they would obviously back someone who talked about defeating the BJP in the elections. RSS ideologue Rakesh Sinha slammed the Archbishop. “This is a direct attack by the Church on Indian secularism and democracy, and this is a direct intervention by the Vatican as these Bishops are appointed by the Pope...” he alleged. The Delhi Minorities Commission has asked the JNU administration the rationale behind its proposal to start a course on ‘Islamic terrorism’. Issuing a notice to the JNU registrar, the panel asked the administration to reply by June 5 if there is any concept paper to start such a course.